This week I started on a new cabinet project. There are some built-in cabinets in the living room of this home. The new home owners liked the idea of the cabinets but not the way they looked. So they asked me if I could refresh them and give them a stylish look. The picture above shows the existing cabinets. As you can see the floor is getting a new treatment also and actually the cabinets were taken out after this pic was taken. 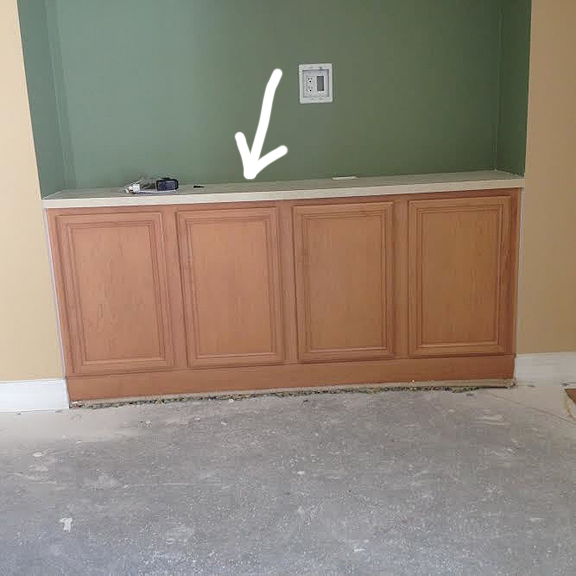 The white arrow shows the laminate counter top the cabinets have and it's a sort of pale yellow. The cabinets themselves are a natural wood look. The idea is to completely change them by giving the cabinets the 'Painted Furniture' look and the counter top will be painted to look like an espresso wood tone. The first thing I do is clean all the pieces with a good degreaser then prime. For the laminate or formica top I scuff sanded it a bit after I cleaned it and used a primer called 'coverstain' it's an oil based primer and thru the years I have had great luck using it on laminate surfaces. It's a white primer, once that dried a few hours I sanded it smooth and then applied another primer over that. I know it sounds a little crazy but I like to use this darker gray primer when I create a wood grain look. I use the gray 'gripper' primer and have the boys at home depot put in 2 oz of black and 2 oz of raw umber. It gives the primer a really nice warm gray. You can see in the next photo how I have almost completed putting the gray primer on. I start with this primer whenever I can but with the laminate I've had the best adhesion using the coverstain first. Because the top is formica there were no scratches on it but one small one and it was a real shallow one too. So in these cases I use a filler called MH ready patch. I find that especially with shallow scratches and dips in the surface the MH works best. It works best because it has great adhesion to the surface and with shallow scratches it's hard to get the filler to stay when you sand it smooth. So this stuff works way better than the lightweight spackle. After that scratch filler dried and I sanded it smooth I then applied the first wood grain color. To get the counter top to an espresso look I am using a SW color called Terra Brun for the first coat. I put this on solid covering the whole counter top. The doors are a natural wood look to start off with. I am first going to paint them white. 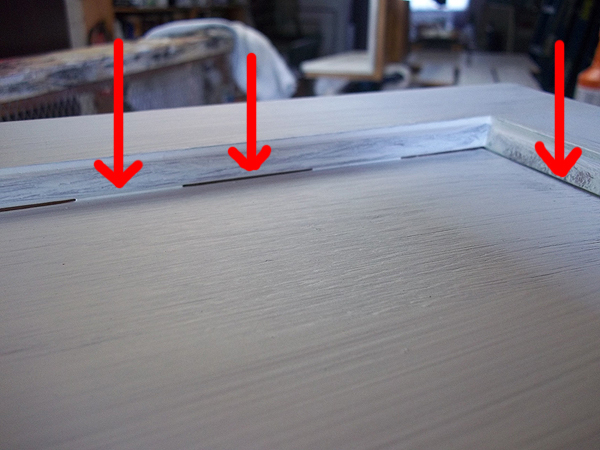 When I paint my cabinet doors white I first caulk in the seam on the front and back of the door. There is always a seam from the center panel and the trim that goes around it. You need to caulk that seam in because if you don't when you paint the door the paint will not totally fill in the ever so slight gap that the seam creates. The next photo shows what I am talking about. You can see how the paint fills in some areas but not other areas. Looks really bad, so you have caulk those seams first, front and back. After they are caulked and the caulk dries you can go ahead and paint the doors whatever color you want. In this case they are getting a BM color called Chantilly Lace. Now because I am going to create the 'Painted Furniture' look with this cabinet I did not prime these doors with the coverstain. That stuff sticks too good and I want to scrape back the paint some in various places to age the doors. So I used a product called 'Sealcoat' by Zinsser. It is a clear shellac that is unwaxed so you can use it as a clear primer. More on this job as it progresses.